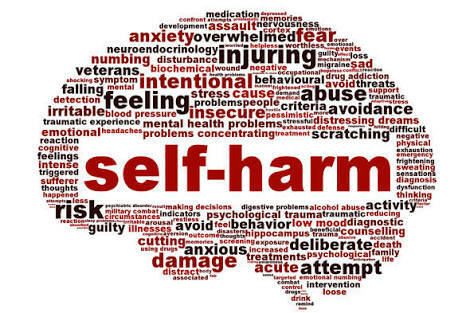 Self-Harm, they may not be crazy! If you are Yoruba, then you definitely know the type of pot called “ikoko-irin’. It’s usually the one used to cook the famous Jollof. It comes in various sizes from small to big, my mom has a lot and I like the pot too, the small ones are cute, to me. I was using one to cook breakfast yesterday morning and i held it with my bare hands unknowingly to take it off the stove. If you know those pots well then you know their thickness makes them super hot when cooking with it. My mind has been wandering for a few days and I will admit, instead of feeling the pain from touching that pot, what I felt was bittersweet. It was painful no doubt but it also felt great. I felt jolted back to reality that instance. And I wanted to do it again, and again. But I didn’t do it again, i have heard of self harm, usually inflicted upon self by people who are depressed. That episode got me thinking a lot about people who inflict pain upon themselves. If I felt that happy at hurting myself, why won’t I do it again, and again. I really don’t know though. Maybe I’m crazy, maybe I’m not crazy. I can’t imagine the pain that comes with self-harm. I can’t speak categorically for people who do because I only experienced this for a second. However, if you do this or are contemplating doing this, I want you to know that you are not alone, like I have been told these past few days, please don’t do it. This may help someone out there.